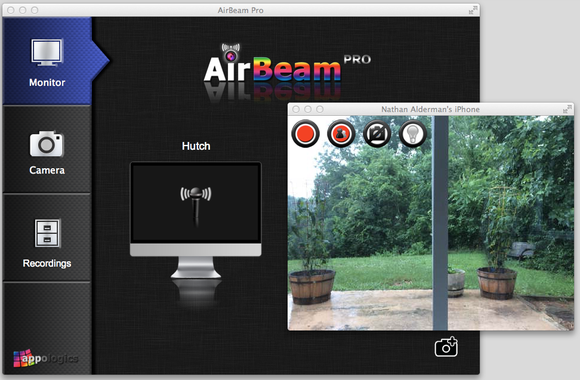 Whether you want to beef up your home security, save a few bucks on a baby monitor, or just pretend you’re James Bond, Appologics UG’s AirBeam Pro (Mac App Store link) provides an inexpensive, powerful way to turn your existing Macs, iPads, and iPhones into a sophisticated home security system. After a simple installation, AirBeam Pro starts looking for AirBeam-enabled cameras on your Wi-Fi network. It won’t work with third-party cameras, but if you’ve purchased and installed separate copies of AirBeam for your iPhone or iPad, or have AirBeam running on other networked Macs, the program will find them and start displaying crisp real-time video streams. You can also make your own Mac a camera, and broadcast that video to AirBeam on your portable devices, or to anyone on your local network via a Web connection tied to your Mac’s local IP address. (There’s a separate free Mac client for simply watching streams from other devices.) AirBeam even supports Motrr’s Galileo motorized mount for iPhones, letting you pan and tilt remote cameras. Optional password protection prevents prying eyes from peeking at your camera. AirBeam’s motion-tracking feature will—after a short delay—start recording anything that moves in the camera’s path. You can even set up email alerts any time one of those videos gets triggered. Want to get a better look or spook intruders? Turn on your iPhone’s flash beam with a single click. And if you need to monitor your home from another network, AirBeam can enable port mapping on routers that support Universal Plug & Play or Apple’s NAT protocol. It’s a shame that Appologics offers no free camera-only or viewer-only clients for iOS devices. And the thought of turning your iGadgets into surveillance tools quickly gets spooky. But AirBeam makes the whole process simple, effective, and undeniably cool.